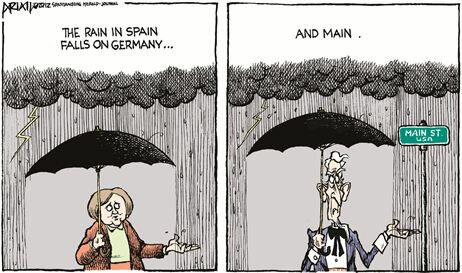 In what is becoming a tiresome annual event, for the third spring/summer in a row the financial markets have again come under the spell of Euro-zone economic troubles. Global stock markets move higher when the “great minds” of Europe’s policymakers seem to be moving to defuse their troubles, only to swoon when they yet again come up short and hopes are dashed. 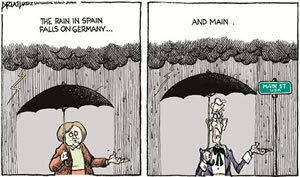 To be sure, the Euro-zone troubles are considerable. Economic weakness across much of the region will almost certainly continue to be chronic in nature. On the domestic front, the grind-forward U.S. economic expansion should continue. This is despite Europe’s problems, slowing growth in China and other emerging market economies, and recent punk domestic economic readings. The primary factor underlying the expansion remains the under-appreciated dynamism of the economy. The housing market is healing, domestic banks continue to build capital to levels last seen 75 years ago, vehicle sales are recovering, inventory levels remain lean, and yes, even job growth continues to inch forward. In addition, the wellspring of the current dynamism—the technology and information sharing revolution—remains vibrant. This dynamic continues to lay the foundation for healthy productivity growth and a rising standard of living. In addition, technology and innovation are enabling such developments as a renaissance in manufacturing that some are calling another industrial revolution and a potentially “game-changing” and market-derived solution with respect to domestic energy supplies. All this does not mean that everything “is fine” in the economy. The deep-seated level of fear, uncertainty and doubt about the future that we have discussed on prior occasions, remains like a giant wet blanket on economic dynamism. In part, the anxiety reflects the psychological scars of the 2008 financial panic and the feared potential for a repeat emanating from Europe. But another huge source of concern is Washington’s wet blanket. The uncertainties associated with the prospects for significant tax hikes, new complex regulations, the rapid expansion of Treasury debt, and the government’s intrusion into the economy are smothering economic dynamism. As we have previously noted, the Fed did not repeat the disastrous mistakes of their 1930s counterparts during the heat of the 2008 financial panic. The same, however, cannot be said for fiscal policy as Washington has made a Depression-era repeat of sorts. Though these words were spoken in 1937, one could easily believe they were uttered 20 minutes ago! Granted the world of the 1930s is much different than that of today. However, as was the case then, a not-so-limited government has limited the economy. The grind-forward pace of the expansion, persistently high unemployment, lackluster new business formations, and the increased fear that the visible hand of government is turning into a fist, are just some of the symptoms of the limiting actions both then and now. The grind-forward expansion also suggests that the corporate earnings collapse some prognosticators foresee does not appear imminent. The general trend in earnings growth is indeed slowing, but it typically does so as economic expansions advance. This development has significantly different implications for near-term stock market movements than does a backdrop of collapsing earnings. Without earnings cascading lower, a key catalyst for a pronounced “bear market” in stocks is likely absent. In addition, significant stock market “tops” are typically preceded by a pronounced tightening of monetary policy by the Federal Reserve (“Fed”). Instead of this precondition being in place, we have a Fed that appears bent on finding reasons to ease policy further. 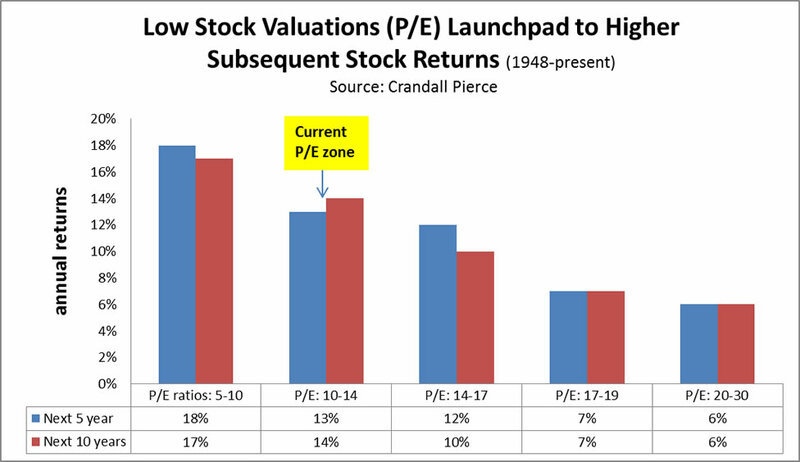 A slow overall earnings growth environment should favor growth stocks however, as investor thirst for growth becomes focused on a sub-set of the market “population”. The past two years escalating Euro-zone fears triggered an across-the-board sell-off in U.S. stock prices. This year by contrast, some stocks–particularly those helping to drive the dynamism that does exist–are displaying resilience to the overall trend. Furthermore, it is important to remember that neither Washington’s wet blanket nor the European situation represent newly emerging troubles. From an investment perspective, the markets have been stewing in these issues since 2008. As a result, glum expectations are widely priced into stocks and bonds. 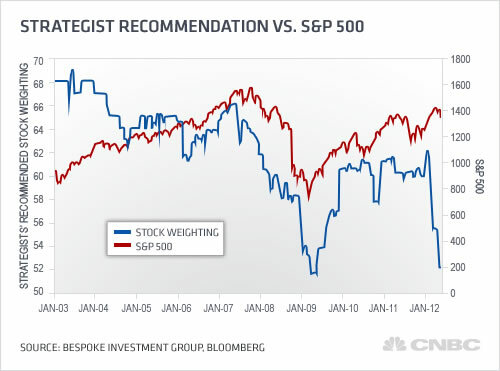 The stock market’s current low valuation condition reflects widespread concern about the economy and earnings prospects as demonstrated in the chart above (click it for a larger view). Meanwhile these same fear factors are manifested in the ultra-depressed state of prevailing bond yields as reflected by the chart to the right (click it for a larger view). However, are things really so bad that bond yields can be sustained at levels lower than those that existed at the bleakest point of the Great Depression? With such low expectations, not much needs to go right for the element of positive surprise to arise. If the wet blanket were to be lifted even a little–the potential for a significantly stronger U.S. economy and a reallocation out of bonds and into stocks by investors on a massive scale could transpire. It is true history may not repeat, but it may provide a good blueprint of what investors may experience if and when the wet blanket lifts. 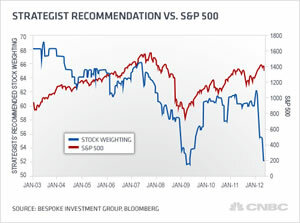 The chart to the right (click it for a larger view) shows the investment potential of stocks from the various valuation levels. 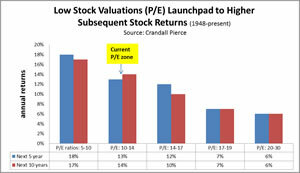 Current modest market valuations (P/E in the 10-14 range) make for very rewarding prospective multi-year returns. 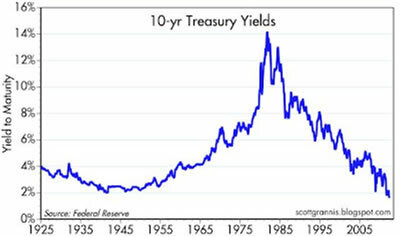 By contrast, history suggests that from current yield levels, the prospective returns for the safest bonds are anything but “safe” as demonstrated by the chart below. The last time (1946) Treasury bond yields were even close to today’s sub 2% levels, Treasury bond investors were not treated well…for a long time. Economic growth troubles in significant portions of the Euro-area are likely to be chronic in nature. Welfare states fueled by unsustainable government spending and borrowing are hardly solid economic foundations. The term Euro-sclerosis captured their own government-induced economic wet blanket conditions of chronically slow growth and high unemployment that prevailed across many countries within the region well before their current sovereign debt/banking issues came to the surface. Note the U.S. is an important exception! The cultural barriers to reducing widespread dependence on government and the forms of cronyism prevalent in many economies render the type of reforms that would spark economic growth very difficult. In the short run the prescriptions offered to alleviate the debt issues include tax hikes, which will likely further stifle what little economic dynamism that exists. As demonstrated by the chart to the right (click it for a larger view), growth prospects will be aggravated by unfavorable demographics in the longer run. 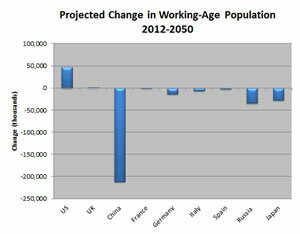 Fewer workers is the prevailing demographic across much of the world…including China. It is conceivable that portions of the Euro-zone could suffer conditions of a slow-motion depression, the same wet blanket that the Japanese government has administered for the past two decades. Investors can navigate a no-growth Euro situation. What must be avoided, however, is the potential of their sovereign debt-banking troubles to provide significantly adverse spill-over effects for the global financial system. At present, financial system stresses emitted from the Euro-region do not look worrisome. 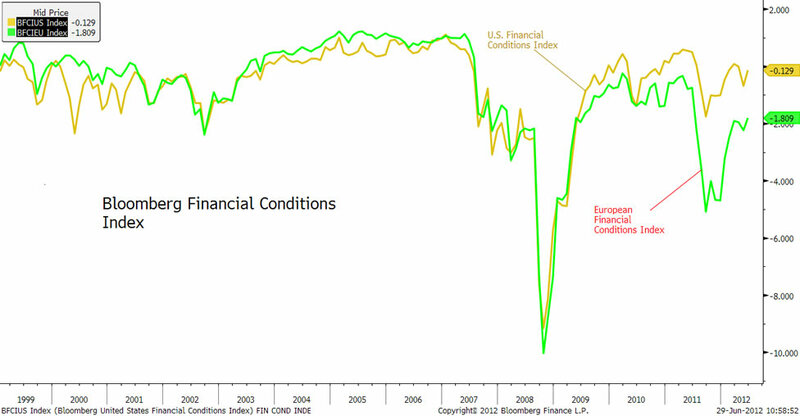 The Financial Conditions chart to the left (click it for a larger view) provides indicators of financial system stress for both Europe and the US. The indicators are composites of financial variables (lending spreads, stock markets, bond market indicators, etc.). When stress in the financial plumbing underlying the economy increases–as in 2008–the indicators register a decline. The chart shows that depsite bouts of increased stress within the Euro-zone fianncial system, the transmission to the U.S. financial system has been negligable since 2009. Things may change, of course, and ongoing monitoring is necessary, but at this point we do not see the need to alter our already conservative investment posture. 1 Lammont du Pont as quoted in Regime Uncertainty, Why the Great Depression Lasted So Long and Why Prosperity Resumed After the War, Robert Higgs, The Independent Review, Vol. 1, No. 4, Spring 1997.